On the way back from Bam to our hotel in Kerman our guide suddenly announced we were going to make a stop in Mahan to see a palace and a mausoleum. It was almost dark and we had absolutely no idea what to expect. First, we go to see the palace. 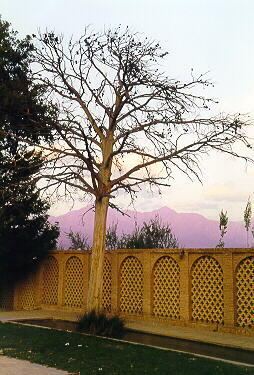 This palace and its gardens are known under the name of Bagh-é Shahzadeh. 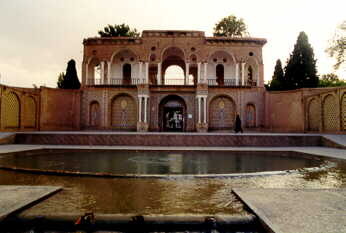 It dates from the Qajar period (19th century) and was used as the summer palace of Prince Abdul Hussein Farmanfarma. 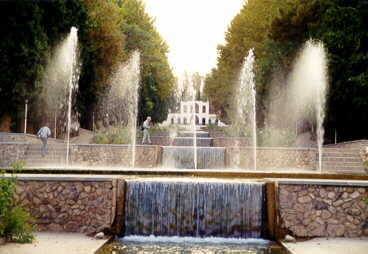 The gardens are a delight, all those fountains make us thinks of the Generalife in the Alhambra in Granada. Too bad we don't have much time, or it will be dark before we arrive at the mausoleum. It isn't completely dark when we get there, but it's already too dark to make any photographs. I managed to make this one below, but it required a very steady hand (and a little bit of help from a sturdy wall). 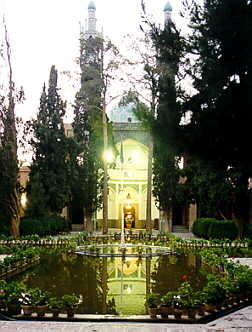 The mausoleum is the burial place of Shah Nur od-Din Nematollah Vali. He was the founder of the Nematollah order of dervishes. Dervishes are a special kind of Muslim, very religious and very peaceful. To become a dervish you should go through a ritual of fasting. 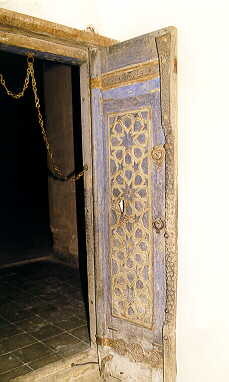 Aspirant dervishes lock themselves up in a very small room. For 40 days they keep themselves to one date and one drop of water a day. With such a ritual, we don't think there are many fat dervishes.